These Blueberry Coffee Cake Bites make the best breakfast or dessert. 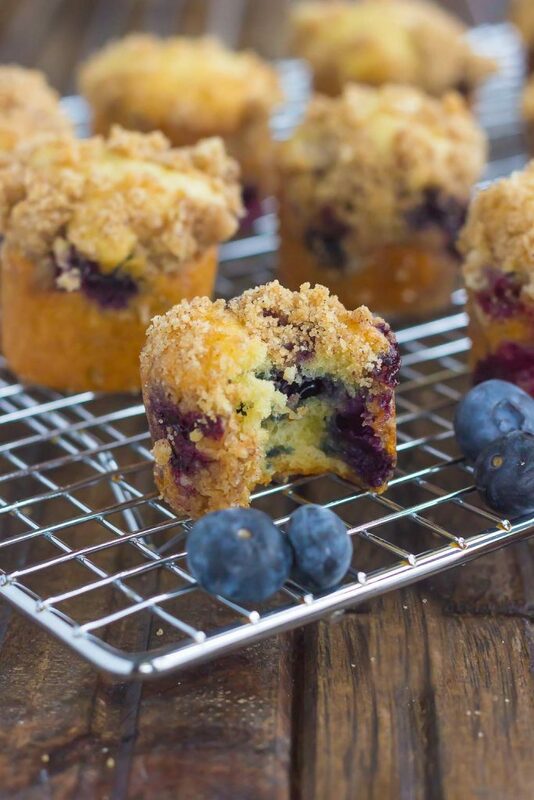 Loaded with juicy blueberries, topped with a cinnamon crumble, and baked to perfection, these mini bites are fun to make and even better to eat! Oh, mini foods…how I love thee. 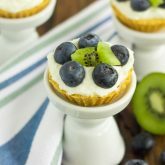 First, there were these Mini Blueberry Loaves, then came these Mini Strawberry Orange Scones, then those Mini Caramel Apple Yogurt Pies, followed by these Mini Sausage Quiches, those Mini Strawberry Peanut Butter Cheesecake Pies, Mini Blueberry Kiwi Tarts, and Mini Strawberry Heart Pies. I think it’s safe to say that I adore mini foods! And I think you do too, right? After all, they’re just so cute (and delicious) to eat! My inspiration for these Blueberry Coffee Cake Bites came from Target (my favorite store). As I was strolling along their bakery section, I came across mini coffee cake bites and was instantly hooked. The flavor, the texture, the taste, the coffee cake in MINI form! How fun would these be to recreate?! 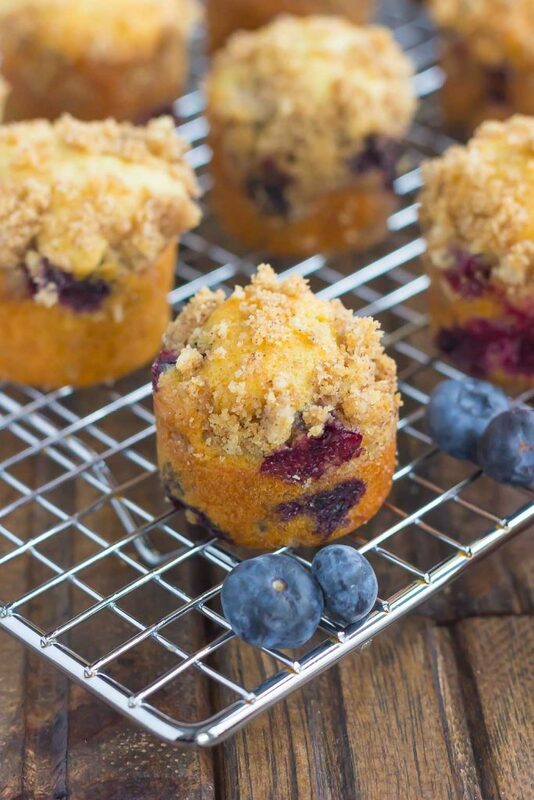 And really, who can resist mini foods as cute as these Blueberry Coffee Cake Bites? 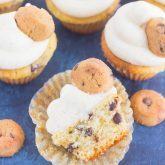 They have all of the flavor of a regular coffee cake (this recipe is adapted from my Blackberry Crumb Coffee Cake) but in bite-sized form. 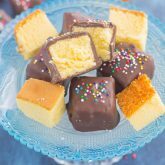 Soft, moist, and sweet, these bites won’t last long in your house! And because they’re mini, it means these bites make the perfect, grab-n-go breakfast or snack. And the best part? You got it! These Blueberry Coffee Cake Bites are so easy to make! In just about 30 minutes, you can have these cuties prepped and ready to be devoured. Sounds pretty good, right? 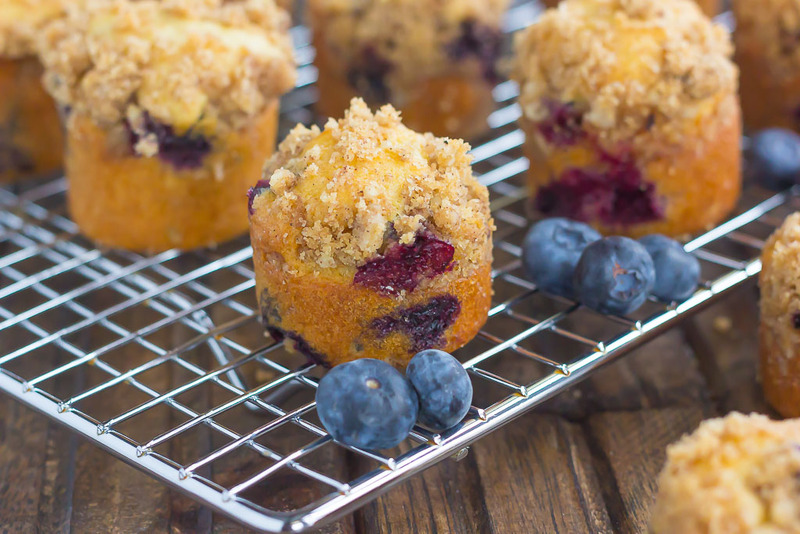 So, if you’re looking for that new breakfast or sweet treat, impress everyone with these adorable (and delicious) Blueberry Coffee Cake Bites! Preheat oven to 350F. Lightly grease a 12-count mini cheesecake pan or mini muffin tin with non-stick cooking spray. Set aside. To prepare the crumb topping, add brown sugar, white sugar, cinnamon, melted butter, and flour to a medium bowl. Stir to thoroughly combine. Set aside. In a medium bowl, whisk flour, baking powder, baking soda, and salt. Set aside. In a large bowl, beat butter and sugar until light and fluffy, about 3-4 minutes. Add yogurt and milk. Beat until combined. Add in eggs, one at a time, followed by vanilla extract. Beat until combined. Slowly add in flour mixture and stir until just combined. Gently fold in blueberries. Spoon batter into prepared tins about halfway full. Sprinkle crumb mixture on top of batter. Bake for 15-20 minutes, or until toothpick inserted into middle comes out clean. Mini cheesecake pans are my newest find and it's so fun for mini desserts! :) And who can resist foods in mini form, right? Thanks for the coffee cake love and pin, friend! Okay! You and I are definitely on a same wavelength these days! First the peas and asparagus and now blueberries! I love coffee cake, and when presented mini, all the better! Pinned! Blueberries (and asparagus) are the best! Especially in the spring. Thanks for the sweet comment and pin, Annie! Breakfast goals are the best! :) Thanks, Sarah! Gayle! what a great idea! 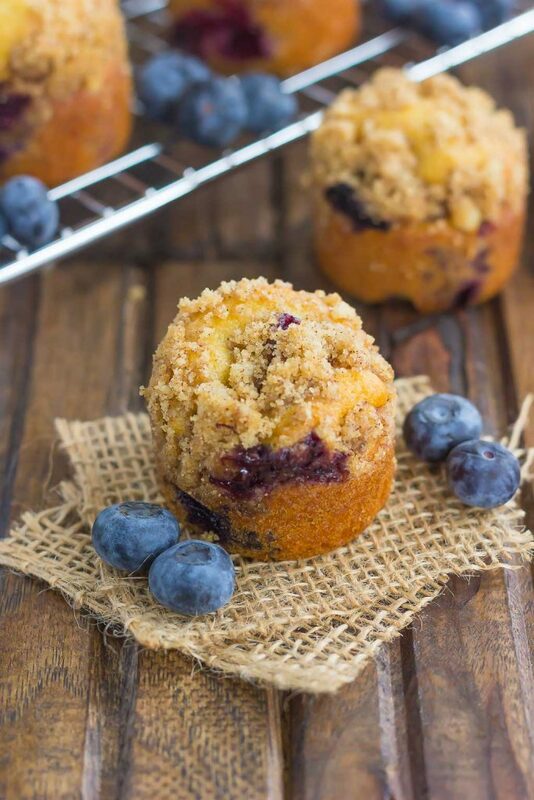 love these blueberry coffee cake bites! The perfect size! Yum! I don't think the mini size will keep me from eating to my heart's desire:) Love the inclusion of yogurt in the batter! I love adding Greek yogurt to baked goods...it's my secret weapon! :) Thanks for the kind words, Milena! Love blueberries and these look so cute and delicious! And the fact that they are mini, means I can have more than 2 :) Pinned! More than two is the best! :) Thanks, Mira! I'm with you about mini bites…just love them. Your little treats would be so nice with a cup of tea in the morning. Tea and these bites would be wonderful! Thanks, Karen! Is it weird that I get a ton of baking inspiration from Target, too?? Mini foods are the best and these look seriously awesome. I love all things blueberry!! Isn't Target the best? :) Thanks, Sues! Mini foods are the best and these coffee cake bites are the cutest! Love this idea! Doesn't streusel just make everything better? I'm with your husband...I love those mini crumb muffins, too! Thanks for the kind words and pin, friend! Mini foods ARE better! How perfect would these be for an Easter brunch!?? Love! Gayle, these are absolutely adorable!!! I could count the ways I LOVE mini right along with you! You've got me so intrigued about all of your mini treats, including: the mini strawberry hearts pies and the blueberry kiwi tarts! Anyway, the mini-er, the better. :) I'm absolutely drooling over these blueberry coffee cake bites. Pinned, of course. Happy Monday! Haha love it...the mini-er the better! :) Thanks for the coffee cake love and pin, Demeter! Happy Monday to you, too! I'm sure they would be, thanks Blair. Mini things are just cuter - I always like things better when they're little :) these look SO packed with flavor too, loving that crumb topping! 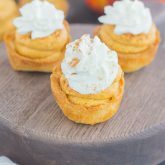 Aren't mini desserts the best? Thanks, Rachel! I love love these cute little coffee bites Gayle! Such a unique idea girl!! aww so cute! perfectly poppable! haha yup I'm with you - mini foods are the BEST! And mini coffee cake bites?? I mean, yes please! These look and sound delicious! Thanks for the coffee cake love, Ashley! Can this be made minis the blue berries. Will it still taste delicious. Hi Jenny! It can certainly be made without the blueberries. I'm assuming it will still taste the same, though I haven't tried it without the fruit. Sorry about that, Judith! I updated the recipe directions to include when to add the blueberries. You would add it after the flour is mixed in. Thanks for letting me know and hope you enjoy these!